Just found a new reading challenge about to start in January and I'm super excited about it! 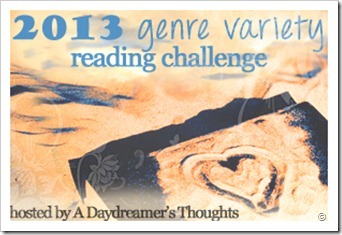 This will be the third reading challenge I've participated in and it is being hosted by A Daydreamer's Thoughts. The challenge is to read a certain number of books from various genres (as if you couldn't tell from the blog title). [x]Runs from January 1st 2013 until December 31st 2013. Sign ups will be open until December 1st 2013. [x]There are five levels to challenge yourself too. You may move up a level but not go down a level. These are all outlined below. Please mention in your sign up post which level you will aim for. [x]The genres you choose to read are up to you. As long as every book is different, whichever genre you wish to read you can. [x]There will be a giveaway at the end of the challenge, and maybe a few within the year but these are TBD. [x]To sign up, you will need to write a post saying which level you are challenging yourself too and then use the linky list. Non-Bloggers may post in the comments of this post. [x]Any book formats are accepted. [x]Novellas and Novels are all accepted for this challenge. [x]YA, NA and Adult books all count towards this challenge.